Hi! Today marks the arrival of a fun new nail art group that I'm excited to be part of. 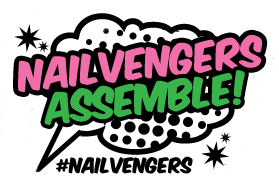 Nailvengers Assemble is a group made up of Sammy from The Nailasaurus, Lucy from Lucy's Stash, Alice from One Nail To Rule Them All, Amelia from xameliax, and myself! Since we all met each other at the Cosmopolitan Blog Awards we've been thinking about starting a group, and here it is! At the end of every month, the five of us will be posting nail art of a particular theme. Our very first theme is New Year, New Technique, so we're all trying something new to us! For my new technique, I've chosen a spray marble. The idea is to blob polish onto the surface of water (as with a water marble) but instead of drawing patterns in it, you spray it with hair spray. It was a bit of a risk because me and marbling do NOT get on. Not a bit. I thought this would be easier than a full water marble, and it was, but barely! 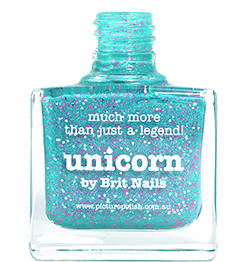 Every time I sprayed the polish with hair spray it just flew off to the side or shrivelled. In the end I tried warm (almost hot) water, and it worked better. It's still not exactly as I pictured, but I like the effect it created. 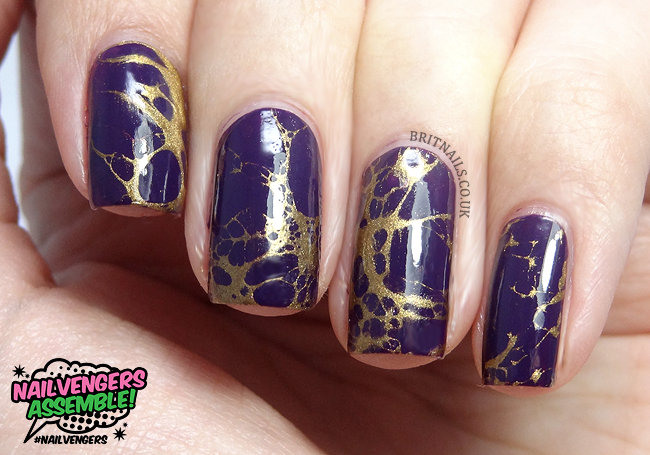 I used Barry M Plum as a base, and H&M Golden Treasure to marble with. 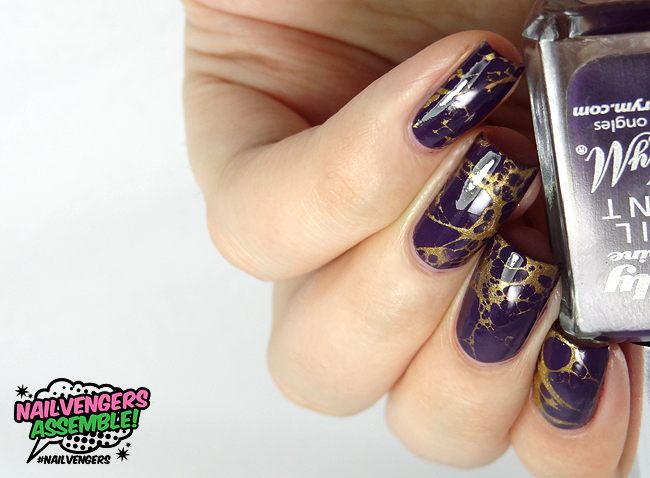 If you're inspired by any of our designs, use #nailvengers on Instagram or Twitter so we can see! You can also like us on Facebook! I've only tried this spray marbling once and used alcohol (desinfectant pump spray) and it worked fine. Maybe the hair spray pressure was too strong? what kind of alcohol did you use Moni? I used one of these sterilising alcohol mixes (I think it's isoproanol and ethanol or however you call it in English) in these "pump sprays" without gas pressure. Maybe you could call these rubbing alcohol? And spritz bottle? They worked finen for me, but it depends on how you spray, once from far away might be best for fine hole, the big drops don't fly too far. It's totally different than anything else I've seen. Weird and I like it! 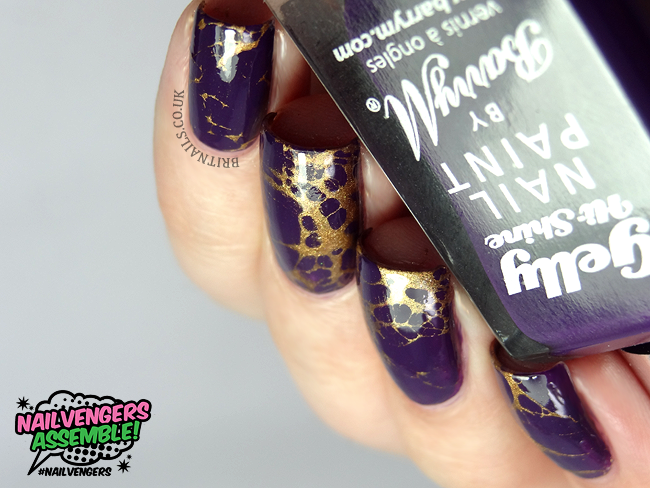 That looks so good - the contrast of gold and purple is amazing! I will have to try out a water technique at some point. Love the colors you have chosen. Looks supernatural:-) I love all manis of your group n visited all . I think this looks very cool! I love the color combination too! Very good idea! I do it! It looks like the spiderwebs from that experiment where they gave drugs to spiders and they all went a bit crazy. I like it! Purple and gold go so well together, simply beautiful.